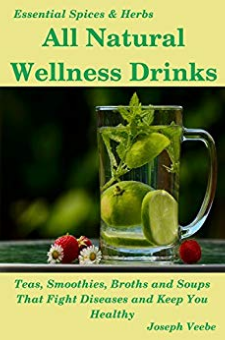 Contains 35 recipes for wellness drinks that includes teas, smoothies, soups and vegan & bone broths. The recipes in this book are unique and combine super foods, medicinal spices and herbs. These drinks are anti-cancer, anti-diabetic, ant-aging, heart healthy, anti-inflammatory and anti-oxidant as well as promote weight loss.By infusing nature based nutrients (super fruits and vegetables, spices and herbs) into drink recipes, we get some amazing wellness drinks that not only replace water loss but nourish the body with vitamins, essential metals, anti-oxidants and many other nutrients. These drinks not only help heal the body but also enhance immune system in preventing many forms of diseases. These drinks help rejuvenate the body and delay aging process. Some of the spices used in these recipes are tested over the ages and their health benefits are proven over thousands of years of use. Modern medicine has been increasingly studying many of these herbs and spices. By incorporating these spices and herbs along with other super foods, in making these drinks, we get a lot more health benefits than traditional wellness drinks.This book contains the following:A list of superfoods and their benefits:Super fruits: Berries, Pomegranate, Mango, Kiwi, Lemon, LimeSuper veggies: Kale, Spinach, Broccoli, Bitter melonMedicinal spices: Turmeric, Ginger, Garlic, Cinnamon, Chili, Cardamom, Cloves, Cumin, Black pepperHerbs: Rosemary, Basil, Cilantro, ThymeOther ingredients: Olive oil, coconut oil, Legumes, Apple Cider Vinegar, Bones, TeasThese selected ingredients are extremely healthy and has high anti-oxidant, anti-inflammatory, anti-microbial and anti-cancer properties. Most recipes include a combination of several ingredients from the above list. A sample list of recipes includes:Spiced tea or masala chaiLemon and ginger teaHot turmeric milkGolden yellow SmoothieGreen smoothieVery berry smoothieVery bitter drinkChicken bone broth both spicy and non-spicyVegan brothLamb broth both spicy and non-spicyBeef bone broth spice and non-spicyBlack bean soupRed wine drink with garlicIn addition to these recipes the book also includes wellness drinks for special health conditions such as cold&flu. Nausea, detoxification, anti-cancer, anti-diabetic, etc.All Natural Wellness Drinks is a quick read and offers a lot of drink recipes that suites your taste and preference. This book is a great tool to have in your healthy living tool box. Get your copy today.